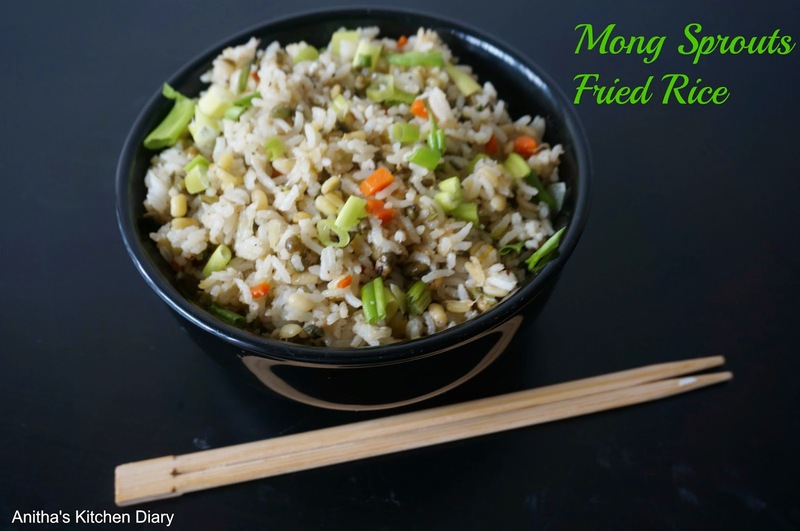 Moong sprouts fried rice is a protein rich rice dish. Two days back i soaked green gram for making pesaratu.Retained some green gram to make sprouts. When I bookmarked this recipe from Sharmi's Passion made my mind that i should do this recipe when making sprouts again. So without second that i made this recipe with the sprouted green gram. In a blender , grind garlic and green chilli into a paste.Chop the vegetables finely.Soak Basmati rice for 30minutes before cooking.Pressure cook it with 1 1/2 cup of water for 3 hisses. Cook the sprouted mong dal in a pan with little water until mushy. Separate the cooked water and sprout.Keep it aside. Heat oil in a heavy bottomed pan,add chopped spring onion (reserve some for garnishing) and saute for 2 minutes. Then add garlic and greenchilli paste and saute until raw smell goes. Add carrot and cabbage saute till cook. Now add sprouts and cooked water. Keep saute for 2 -3 minutes.Now add soya sauce , pepper powder and required amount of salt.Give a quick stir to mix well. Now add rice and mix well. Garnish with remaining spring onion and serve. Serve along with any manchurian as a side.